One question we get quite a bit is “what does a motorcycle accident attorney in Los Angeles actually do?” The answer is, of course, a lot of things. Many of them you can surmise quite easily: arguing in court (should the case go that far), taking on the other side in negotiations, putting together your case, and so forth. An insurance company is difficult to beat in a motorcycle accident case. They have so many resources at their disposal. What they can do is absolutely staggering. You need a law firm with the resources to match. We can help. In this article, we’ll discuss what our resources can do and how it helps your case. In a motorcycle accident case (or really, any kind of personal injury case) it’s important to remember that the insurance company is not on your side. Yes, we say that a lot on these blogs, but it really can’t be stated enough. The insurance company looks out for the insurance company, not you. You have to look out for yourself. Typically, the best way to do that is to get a motorcycle accident lawyer on your side. That way, we can deal with the insurance company so that you don’t have to. Another big reason to get a law firm like ours on your case is that we can match the resources of the insurance company. If you’ve never had to deal with an insurance company before, it can be a bit difficult to wrap your mind around the kinds of resources they have. How deep the resources are and how adapt an insurance company is at marshalling them. Of course, they’re in the business of marshalling them against you and your case, so that they don’t have to pay you the compensation you deserve for everything that you’ve been through. This apparatus is complete and can be difficult to take on. A smaller law firm, lacking in resources, can get swamped and overrun. That won’t happen to us. When an insurance company adjuster calls you, that’s not the only action the insurance company is taking in your case. They’re using their resources to put as many people as they need on your case to make sure you don’t get your compensation. The insurance company can bring in anyone they want on your case. They can bring in investigators with real experience and prestige. They can hire the absolute best attorneys in their business. They can also hire the kinds of expert witnesses that can make their case so much more compelling in court (whether or not their case is true). So, injured folks who sign with a law firm that can’t match those resources can find themselves at a severe and even insurmountable disadvantage. When only the other side can hire the best investigators, and your side can’t, then it’s harder to prove your case, even if you have the truth on your side. When the insurance company can bring in great expert witnesses who exclude expertise and professionalism, then it’s hard to get your message out the right way. With the LA Injury Group, we can match all of that. It costs money to run a motorcycle accident injury case. When you sign with a law firm like ours, you won’t have to pay it. We work on a contingency basis, which means that we don’t get paid until you do. Contrast that with the insurance companies, who only get paid when you don’t. See, their entire business model revolves around the idea of making sure that you don’t’ get paid. When you don’t get paid, they get paid more. On the other hand, when you get paid, that’s the only way we get paid. It’s easy to see which one is on your side. That being said, these kinds of cases cost a lot of money and resources. We can put them to use for your case. We use our resources to get you all of the necessary investigative evidence that you need. Over the years, we’ve cultivated a team of the best investigators. They know what to do, when to do it, and how to collect the evidence that truly matters. Then, in turn, they give us to our attorneys. We work it out so that it makes the most compelling case for you. That way, everything works in tandem to get you the compensation that you deserve. 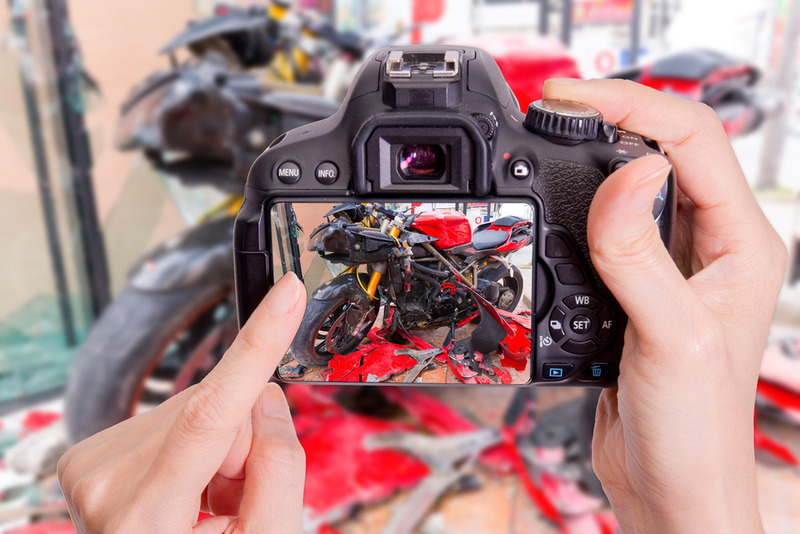 One of the most important parts of a motorcycle accident case is if there are any eyewitness statements. Of course, if you’re in good health and able at the scene, you can ask people yourself. Otherwise, our investigators can do it. We’ll track down the people who saw it and get the evidence that proves your case in the best fashion. They know how to get the evidence that truly matters and do so quickly. In a motorcycle accident case, time is of the essence. Some of the evidence (particularly the evidence at the crash site) can be subject to the elements, disappearing quickly, and so forth. Our pros can get it before that happens. There’s a lot more evidence that can help your case that doesn’t have to do with the crash site itself. Sure, we encourage all of our clients (and even prospective clients) to take as many pictures at the crash site as possible. You never know when you’re going to get that one pic that busts the entire case wide open. By that same token, you want to be able to document your injuries so that everyone knows exactly how you were hurt from the moment it happened. That being said, it’s not the only kind of evidence that can help you. For example, drunk driving and driving under the influence is an all too common problem in southern California. Far too many motorcyclists and other drivers have been hit by someone who absolutely should not have been on the road. Our investigators are experienced with getting toxicology results. Maybe they won’t show that the other driver was impaired but they might. They can be one more piece of the puzzle and our investigative pros can get that for you. By that same token, they can get any nearby surveillance footage. That can explain what really happened so that the truth can come out. Motorcycles are incredible machines. There is nothing in the world like being on a motorcycle, driving through the LA night. That being said, when an accident occurs on a motorcycle, it can lead to more injuries than driving in a car might. There’s so much less protection between the rider and the road. Even a low impact accident can lead to lasting injuries. Motorcycles are more susceptible to road conditions as well. Our investigators can look into those, to make sure that it wasn’t the road’s fault (or the fault of whoever was supposed to be minding and maintaining the roads) when your accident occurs. Road maintenance records, road design schematics – we look into all of them and more. Motorcycle accidents can be extremely difficult on you and the ones you love. If it leads to lost time at work or even diminished capacity and earning power, steps have to be taken. We take great pride in getting our clients the compensation they deserve for everything that they have to go through in a motorcycle accident case. As hard as it might be, we can be there for you. We can’t make this time easy, but we can make it easier. For more information about scheduling a free consultation, give us a call at (818) 210-4558 or head to our site.